75% of organizational change efforts fail. Could YOUR organization be one of the 25% where it works? You can continue to be frustrated by the turf battles, petty squabbles and micro-management that hamper your daily work. You can continue to wonder what you’ll do if you hear “that’s just the way things are” one more time. Moves it from the traditional patriarchal structure to authentic partnerships. Goes beyond the assumptions that people are basically lazy and can’t be trusted. Changes a “winner takes all” mindset to a culture of shared responsibility and recognition. Elicits and honors the ideas and energies of ALL employees. Mitigates conflicts that occur when employees feel they have no power and they don’t have the skills to communicate in ways that transform discord. Shifts from making small adjustments here and there to truly transforming the way people work together. Leads to less stress, powerful partnerships and higher morale. You can use the power of authentic partnerships to create an organization (and a world) that works for everyone – not just for the privileged few. 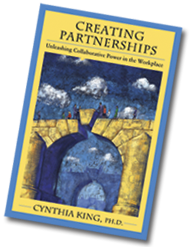 “Creating Partnerships: Unleashing Collaborative Power in the Workplace” by Dr. Cynthia King, outlines change efforts that lead to a partnering organization. She delves underneath traditional techniques that try to solve problems on the surface. She explains how they fail to create long-lasting changes because they don’t address the flaws in the core organizational structure and culture. Dr. King takes you on a journey into the organizational mythology and cultures that allowed our current patriarchal systems to develop. Then she describes practical steps that will help you make the cultural transition into a learning organization based on creating partnerships. This is not academic theory. In her work as an organizational consultant Dr.King has walked her talk. Read the case study in Chapter 5 and you’ll see the results that she helped to achieve with the partnership model. You don’t have to start over! People go happily to work because they are an integral part of a power-with, power-sharing culture. Their voices are heard. Their individual dignity is respected. Everyone feels a part of a community of authentic collaborators and enduring partnerships. People work together to resolve problems rather than competing, protecting their own turf, and working at cross purposes. There is open communication because people trust each other - even when they disagree. You know you can transform disagreements and conflicts because there are processes in place for working through them, people understand those processes and are competent in making them work. This may sound too good to be true, but with the partnering approach outlined in this book it is absolutely possible. Is this for everyone? No. Especially not if you believe that all you need is a better boss! But if you are willing to look deeply at entrenched structures and attitudes, if you are open to examining your organization’s core myths and culture, if you are prepared to develop a learning organization, the foundational work described in this book will save you lots of frustration and expensive headaches later. Don’t wait to take action that can change your workplace and our world for the better. Take the first step towards creating an organization whose success is built on supporting human dignity and nurturing positive relationships. Your choice!